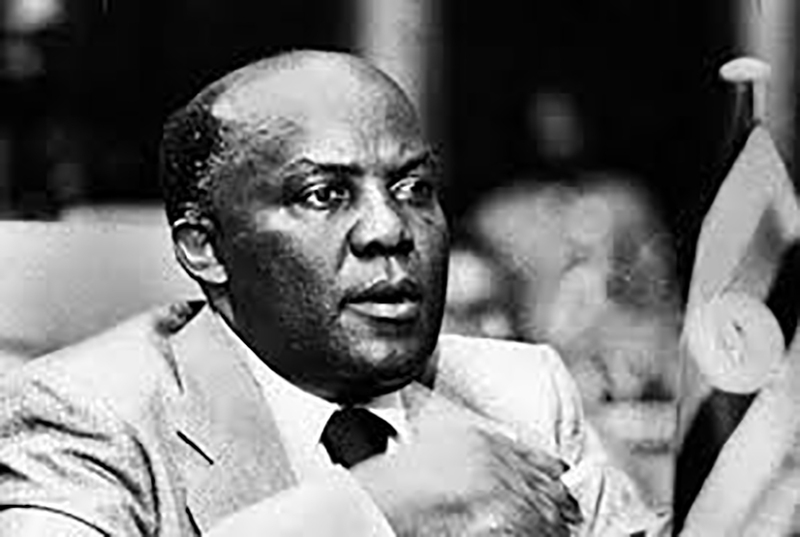 In May 1980, President Godfrey Lukongwa Binaisa was overthrown by Paulo Muwanga in a bloodless coup following a very short stint in State House, highlighted with complete lack of power and authority. Binaisa would become the first Ugandan President to be ousted without shading blood, but this could not have happened had he been shot during a rally in Iganga District, just three months after being made President. In September 1979, Binaisa with a litany of his officials including his defence minister Yoweri Museveni traveled to Iganga District where he held a rally at one of the primary schools. The rally was meant to be for the entire sub region and attracted citizens from neighbouring districts from Busoga region. The rally was proceeding well, with different speaker after speaker working out the crowds that gathered, chanting slogans and preaching unity and development when at a few minutes past 4:00pm, the President was invited to speak to the people. Binaisa had come with so much hope, he had been marketed so well as a lawyer from London and serious diplomat, much to the excitement of the Basoga who wanted to hear him speak. Indeed, a mixture of humour and very good English made Binaisa the bomb. With microphone in the hand, Binaisa started his speech well knowing what the gathering wanted to hear, he started by discrediting Amin much to the thunderous applause of the crowd. “From today onwards, Bokasa Road in Kampala named by Amin will now be called Nkrumah Road. I have changed this by the powers vested in me,” Binaisa said, sending the crowds in to frenzy. Idi Amin Dada in 1972 had changed the road from Aldina road and named it after a man he so admired- Central African Republic dictator president, Jean Bedel Bokasa. 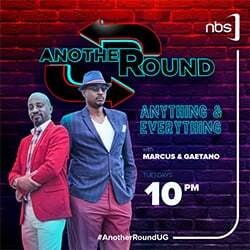 A story is told of how Amin met Bokasa for the first time, the latter came in a military attire decorated like a real Field Marshal, with every medal ever received and dreamed of on the uniform. Amin after that day ordered that a uniform like that be made for him and it became part of him for the rest of his time as president in Uganda. Jean Bedel Bokasa and Idi Amin. Bokasa influenced Amin’s dresscode thereafter. There is no doubt however that he gave Bokasa a whole road in the city centre. 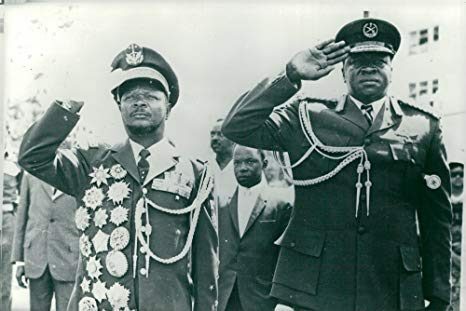 Meanwhile the crowd chanted Binaisa’s name and down with Idi Amin, one man from the crowd shouted; “Omusota” (literally translated from Lusoga to mean snake), and the crowd scampered in different directions, most of them towards Binaisa who was not yet aware of the happenings. Confused about what was happening and at the same time interested in stopping people from running towards and of course running over the president, Binaisa’s body guards opened fire. For about five minutes, there was fire coming from the podium where Binaisa was, meanwhile all this time, the president hid under a table on the podium and his ADC down with him and bullets flying around. It took the intervention of then Minister for Defence, Yoweri Museveni who stood up amidst bullets flying around and shouted an order in Kiswahili to the soldiers to stop shooting. Museveni then ordered the body guards to yank Binaisa from under the table and bring him to his feet. The gathering would resume later with Museveni assuring all the people that it was safe, and like that, he took the show from Binaisa as Basoga kept praising the little man in military uniform(Museveni) for the rest of the day. Binaisa would get time to exact his revenge against Museveni when he fired him from the post a month later. Museveni himself has had his share of snakes causing disorganisation to his body guards. In October last year while addressing a public rally at Kirangira in Mukono District, a snake crept into the President’s tent causing panic. Ministers and VIPs scampered for safety. However, Museveni who was speaking remained calm and his body guards rushed into the tent, and smashed the snake. A month later, in November, Museveni’s rally in Kasanda District was disrupted after a group of women shouted they had seen a snake. The rally got chaotic and people ran towards the president. on seeing this, the Presidential guards coked their guns only to accelerate the stampede. One person was injured in the process.